Amidst the chaos and panic in the aftermath of the 7.9-magnitude earthquake that devastated Nepal yesterday, two tech giants are doing their best to help. Both Facebook and Google have rolled out features to help worried families locate loved-ones trapped in disaster zones. As a simple but powerful database for information on people missing and found, Google's Person Finder has been in operation since the Haiti earthquake in 2010, and it has become an important tool for disaster management in the internet age, with emergency services and NGOs using it to great effect. 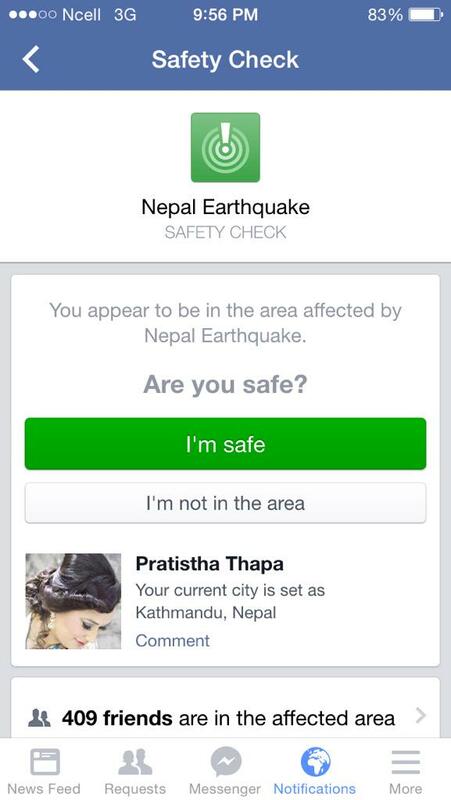 Facebook's Safety Check tool is a more recent invention, debuting in October last year. Again, it's incredibly simple, allowing people to check in to say they're safe, thereby notifying people in their networks. Anxious friends and family are then immediately able to see everyone who's safe. Safety Check goes so far as to ask people in the immediate disaster zone whether or not they're safe, as a gentle reminder to check in. At the its launch, Facebook CEO Mark Zuckerberg said he first developed the app in response to the Tokyo earthquake in 2011. He added: "Safety Check is our way of helping our community during natural disasters and gives you an easy and simple way to say you’re safe and check on all your friends and family in one place." Anyone in Nepal with a smartphone will have been asked to check in. Currently, however, the country is suffering from a lack of mobile coverage, meaning many people are unable to confirm their status. Four men trapped under as much as 10 foot of rubble after the Nepal earthquake were rescued when NASA technology sensed their heartbeats. One medical worker told ITV News it was like 'entering your worst nightmare' as they tried to help look after the injured.